Exactly a week ago today I saw "Captain America: The Winter Soldier", and when I inform you my fiancé and I plan to see it again this weekend with some more people that should tell you a lot about how much we enjoyed it. For the sake of a review longer than a sentence though I'll elaborate on why I liked this movie so much, and what small thing bugged me. Please note there are MINOR SPOILERS, mainly relating to whom the Winter Soldier is and while I don't reveal the big baddie, I do discuss how he/she/they are influencing other aspects and agencies of and within the story. Better than this movie? Some may say so! 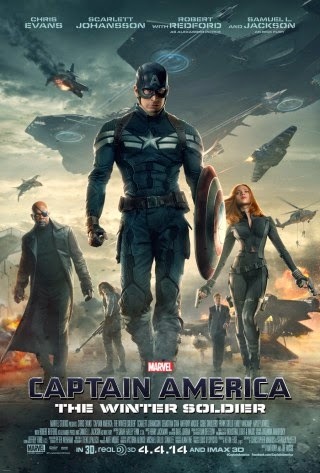 My fiancé thinks that this new Captain America movie is the best Marvel film yet and even better than "The Avengers." I don't know if I can quite agree with that, but I will say this is most definitely the best Marvel film since "The Avengers" graced the silver-screen. As every review has to point out, this is not necessarily a super-hero movie so much as a spy-thriller. 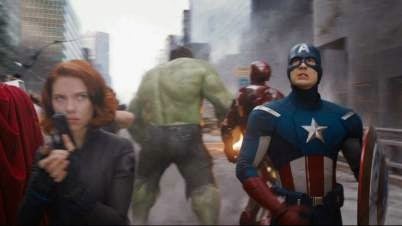 Considering how sometimes the Marvel films involve aliens invading our planet or other-dimensional travel with space-Gods, having this be such a relatively grounded movie about spies and evil organizations results in this being the most--dare I say the word?--realistic super-hero movie since the 1st "Iron Man". It makes sense as a claim, after all Tony Stark and Steve Rogers are a lot alike in some ways despite being vastly different in others. Both are basically normal human beings who were enhanced (be it through a machine-suit or a serum) and now live in this fantastical world of super-beings and are simply trying to make sense of it. While Stark greets his trials and tribulations with snark and a genius mind, Steve Rogers is a pretty humble--albeit strong and well-trained--guy who just wants to do the right thing, making his viewpoint both at once honorable and a bit naive. Some of SHIELD's activities worry Rogers. 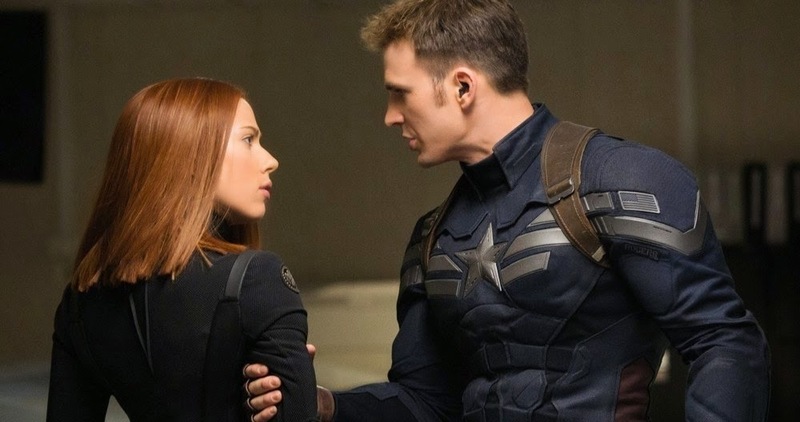 It is Chris Evans portrayal of Rogers determination to be a good and righteous person that brings him into a slight conflict with Fury early in the film, when a new security program/method that invades people's privacy in the extreme is revealed. 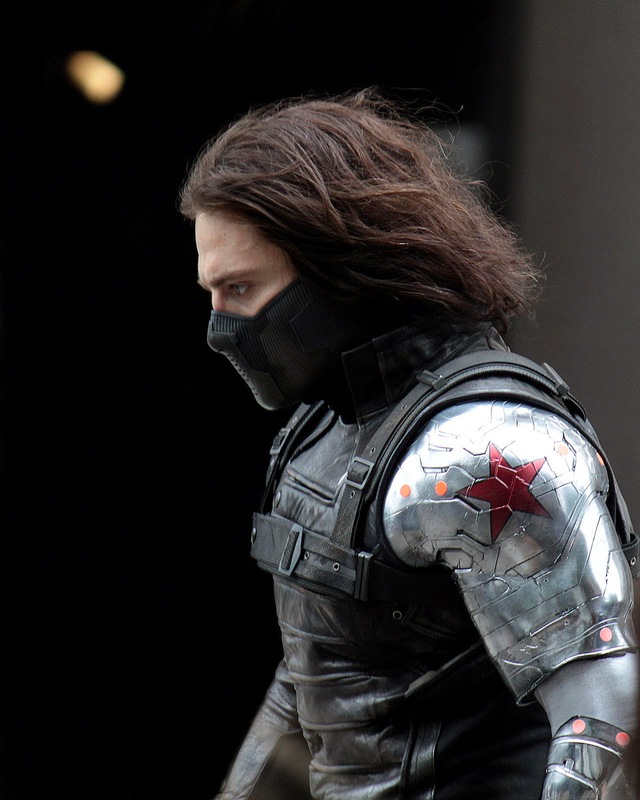 A series of events make almost all of SHIELD untrustworthy however, and the rest of the film is spent with Rogers trying to figure out what evil could be influencing SHIELD, and who a mysterious man known only as "The Winter Soldier" is, whom seems to be very determined to kill Rogers and his allies. Speaking of Roger's allies, this film may be the best Captain America flick, but it also is a really good Black Widow and Nick Fury film. They got more screen-time here in just the first hour than I think either have received if you add together and combine all the other Marvel flicks they have popped-up in. Samuel L. Jackson's Nick Fury is as solid as ever, shown with steely determination to keep this country safe no matter what, and Scarlet Johansson's Black Widow seems to grow a lot as a character in this movie, having been relegated more to the side-lines in "Iron Man 2" and "The Avengers", with her spying-style here conflicting with Captain America's belief in people only doing the right thing and leading to some tension between the characters. Evan's and Johansson's characters don't always agree on their methods. As those of us who have read the comics are aware, the Winter Soldier is in fact a brain-washed and physically enhanced good friend of Steve Rogers, in fact his (former) best friend, Bucky Barnes (played by Sebastian Stan). Barnes' unclear "death" at the end of the first "Captain America" movie had others and myself all but sure he would return, and sure enough he's causing all sorts of damage in this new film. 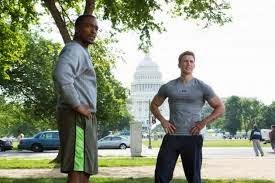 The movie actually waits a fair amount of time to reveal that Barnes is the Winter Soldier, with it in fact being revealed who the people controlling him are before the revelation of his identity. "You don't learn who I am until quite a bit later in the movie." It's interesting we learn relatively early on what has caused SHIELD to no longer be fully trustworthy, as it kind of muddles the initial message Rogers states about how SHIELD's new programs don't promote freedom, but instead perpetuate fear. With it revealed SHIELD isn't fully in control of its actions that kind of shifts the blame away from SHIELD and drops the potentially-fascinating discussion of if people have much privacy in their lives anymore, or if our interconnected-world has made anonymity all-but-impossible. That is probably my biggest complaint with the movie. The startling revelations that are made about SHIELD make sense for the story, but also take a movie where the theme seems to be the shades of gray in what is right or wrong, and makes things clearly "good" and "evil" yet again. This is perfectly alright, but I was especially interested in the earlier parts of the film where it is clear Rogers is wondering, "Is this what I fought for?" before it is revealed, "Oh wait, someone evil is behind all that stuff I don't like." From their first meeting Wilson and Rogers have a great friendship. That issue aside, this movie is wonderfully entertaining, with the great characterization of our heroes we've come to expect from Marvel Films (the introduction of Sam Wilson as the Falcon is a highlight), incredibly-done action scenes, and a healthy dose of humor to keep things from getting too glum. 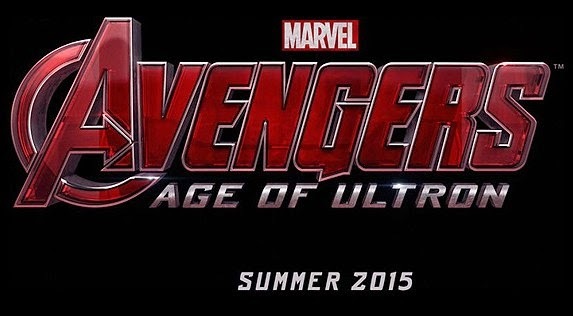 Also, while this film of course stands pretty well on its own, folk will want to stay seated in the theater until the credits are completely finished so as to see some teasers that point to potential plot-lines for the upcoming "Avengers: Age of Ultron" film and third "Captain America" movie. We will see you again soon, Cap! 'Winter Soldier' is a layered and paranoid espionage thriller, what you'd get if John le Carre took a stab at the superhero genre.